To cite: Bibu Prasad Routray. 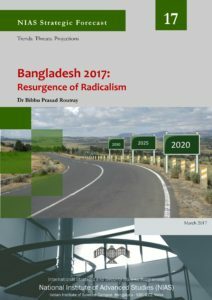 “Bangladesh 2017: Resurgence of Radicalism,” NIAS Strategic Forecast No. 17. Bangalore: International Strategic and Security Studies Programme, National Institute of Advanced Studies, March 2017. In the last two years, Islamist radicalism has witnessed resurgence in Bangladesh… much of these attacks are owned by the Islamic State. While the world believes these claims, government in Dhaka continues to con-test this popular narrative. The ruling Awami League (AL) government on the contrary blames the indigenous Islamists rather than the transnational terror formation for the terror acts. Its response to end such terror has consisted of a series of kinetic operations and systemic targeting of the Islamists. How is this resurgence of radicalism likely to evolve in 2017? This has been analysed by taking into the two principal factors: operational strength and influence of the Islamists; and Official counter terrorism policy.